Letters From Third Grade: If It Ain't Broke . . . I have Christmas tree issues. I wouldn't, but my spouse induces them. Twenty years ago, our son was 18 months old and very active, curious and, occasionally, destructive. I figured a fake tree would fare better than a real one and, when knocked over, would be easier to clean up (no water or pine needles). I bought a six foot faux tree for thirty dollars. We still have it. My husband tells people that our tree is a ratty piece of crap. Because it's old. (Doesn't bode well for me.) In fact, it's quite a nice tree, with one exception. The stand that came with it broke several years ago and it's been a trick keeping it upright since then. The year after the stand broke, my daughter wanted to decorate the tree one Saturday. I was sick as a dog and didn't feel like doing it, but it was getting pretty close to Christmas. Try as we would, we couldn't keep it from leaning or, worse, crashing to the floor. The nearest store was a thirty minute drive, and I was definitely not up for that. I opted to take a nap and try again later. I guess my daughter talked to her dad. When I woke up and went to the living room, the tree was up. It was in a corner near built-in shelves, a mantle, and an entertainment center. Each of these structures was equipped with a C-clamp, to which baling wire was attached. You can guess where the baling wire went from there. The worst part was that the tree still wasn't straight. I cried and went back to bed. Yes, that is the cat performing his ablutions, please try to focus on the tree. It's not so bad, is it? It's not this, by any means. 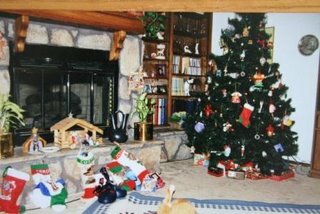 It seems strange when we drag an artificial tree out of the basement or attic and decorate it for about three weeks of display. We then put it back for another year. Think of how many memories all of us retain because of this tradition. We should never deprive other children of a chance to capture memories that will never leave us. By the way, you know the tightwad in me LOVES that you've used the same Christmas tree all these years. I think you should keep it up year round. We have had an artificial tree for several years now too. I bought it after Christmas for 50% or 75% off. Relatively cheap for a fairly decent tree. Since our house is relatively small, there was no good way of keeping a real tree far enough from the woodstove to prevent almost immediate drying out. I watered the thing several times a day but by Christmas it was rather pathetic. We tried for the first few years of marriage to keep the "live tree" tradition but the heat just dried them out too quickly and I hated picking pine needles out of my carpet still yet in July! Didn't matter how many times I vacuumed, I would still be finding them months later. bill - You are right about the memories. When we moved into this house, which has high ceilings, I said I might buy a taller tree (because we have accumulated so many ornaments), and Jess said that was okay but we couldn't get rid of the other one. She has never known a Christmas without it. tracy - I just have a regular tree stand and I put the pole in it and stuff styrofoam peanuts around it until it sort of kinda stays up. Guess I can't criticize the baling wire too much . . . but yeah, I think we got our money's worth. jennine - you know, if I calculate how many hours I spend getting it in and out of the attic, putting it up, taking it down, maybe leaving it up year round would save years that I could be doing something more fun! dorothy - We must have had a 'real' tree the first couple of years we were married, but I have no memory of that. Maybe the pine needles were too horrific and I have repressed the whole ordeal. 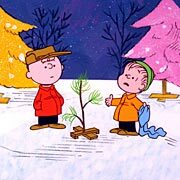 Now you've made me want to watch A Charlie Brown Christmas. Has it been on already? h-man - no, you're in luck! I think it's on tomorrow night (Wednesday). Wait, is today Tuesday? I was at Christina's parents' house the day they brought their tree home. They have a 15 foot or so real tree... We were eating dinner and out of nowhere (without provocation) we heard it crash to the floor in the other room. Water and pine needles everywhere. It's now being held up by bailing wire to the staircase next to it.